In the state of New Jersey, there is a hotbed of talent. There are plenty of talented ballplayers coming out of North & South Jersey. One of the breeding grounds of talent in the Garden State is in Central New Jersey. The Love Ballin Athletics organization was started by Tyreek McNear and Bilal Benjamin in 2012 in Ewing, NJ as a way to help kids develop their basketball skills through mentoring, training, coaching, camps and basketball clinics. This year’s event will feature two girls games on Friday, June 5th at the Ewing Senior Community Center in Ewing, followed by two boys games that will be played on Saturday, June 6th at Life Center Academy in Burlington, NJ. How did the Love Ballin’ program come about? We always wanted to start our own business but didn’t know what. We didn’t want to just do a clothing line, so while we were away at college we brainstormed different entrepeneurial ways to go about it. The things we factored in were that it had to be something we loved that can help others. Then we came up with starting an organization, not just camps and clinics but apparel, showcases, one on one training and more. We wanted to differentiate ourselves from others. Most basketball clubs/organizations focus on one gender. What is the primary motive of the program? We’re here to foster leadership, social stability and love for the game. The Love Ballin philosophy centers on you and your development as a person and as a baller. The philosophy, developed, focuses on a comprehensive approach to each student, of any age, male or female, and at any skill level. The philosophy requires you to be a person of good moral and ethical character, be a baller with strong passion as well a a tough mind and sound body. To be a servant and steward to others, on & off the court. What are the notable players that you have trained? I see it being national. Expanding our game national. Eventually moving Love Ballin’ to the West Coast. What can we expect to see for Love Ballin’ Weekend? 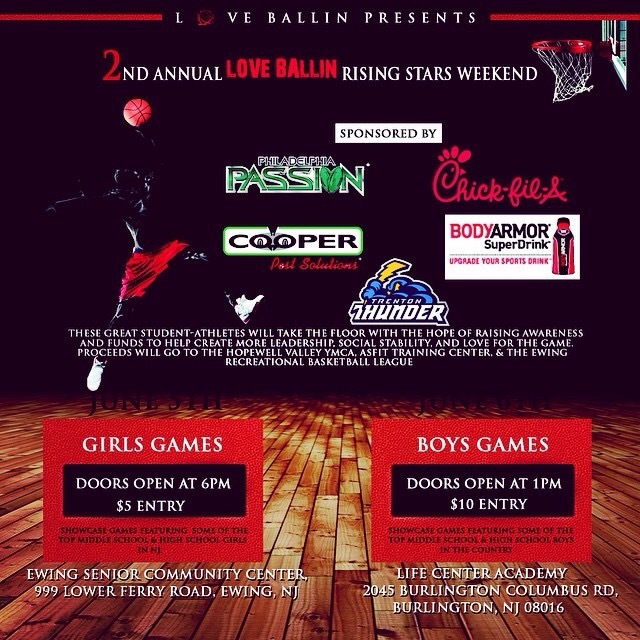 In our 2nd annual Love Ballin Rising Stars Weekend, you can expect to see some of the best young talent in the area. Kids with maximum exposure already and kids with none, but whom also can play at any level, but lack exposure. You can expect to see not only great basketball, but some awesome music by Jaryd Lewis, who will be performing at halftime of the boys high school game. All of our new apparel will be on display. We would also like to thank our sponsors, Chick-Fil-A & Body Armor SuperDrink. Overall, the atmosphere will be incredible. This is a weekend you don’t want to miss. Last year, the girls game was better than the boys game. So don’t downplay Friday night’s game because the ladies can ball too.